I had quite a few emails and messages from people asking questions about travelling with 3 kids to Istanbul. Yes. Absolutely. The tourist areas are very tourist-friendly. The locals are very friendly and hospitable! There were lots of police in the tourist areas, but they were dressed casually (shirt, jeans and a police vest), not full-blown army/military uniform. Food and eating out was very cheap. One morning, we ate a hot breakfast at a touristy cafe and we fed a family of 5, including 2 Turkish breakfasts, 2 omelettes, a side of bread, 5 drinks… for about AUD $30 . One evening, we had a delicious Turkish dinner for a family of 5, including pizzas, seafood, meat grills, salads, drinks and desserts… and the total was about AUD $48. It was fantastic. We booked with a “Superhost” in a 5-Star rated apartment with 2 bedrooms, lounge room, kitchen (sleeps 5 people), situated about 5 minutes walk from the Blue Mosque (which is pretty much THE top rated thing to see in Istanbul) and it cost us around AUD $500 for 3 nights. A wonderful combination of Eastern and Western culture. Turkish summer is July/August and apparently can get very (very!) hot. We aimed to go slightly before (in June) or slightly after (September). My husband and boys wore t-shirts, jeans or shorts. I wore t-shirt with comfy jeans, culottes, or a midi skirt most days. If you visit a big/famous mosque, they have helpers who look you up and down to judge if you are dressed appropriately, then they provide scarves, elastic skirts (for women and men! ), and little plastic bags so you can take off your shoes and carry them with you. We focused our trip in ‘The Old City’ area, or Sultanahmet District, where the majority of all the historical sights were. We booked ZERO tours, because I already did lots of research, I wanted to see specific things, I already knew the history – and with kids, our plans were bound to change, so I didn’t want to be stuck on a 4 hour tour. Our kids were aged 15, 13 and 9 years old during this trip. – Arrived 8am in the morning (Sunday) after flying for 17 hours from Australia. – Drop off luggage at the Airbnb. Breakfast at local cafe. – Took a walk around the Sultanahmet Square and Sultanahmet Fountain and saw all the big sights from the outside eg. Sultan Ahmet Mosque (Blue Mosque), Hagia Sophia, other museums and enjoyed soaking up the atmosphere. We ate food from street vendors and did a lot of people watching. 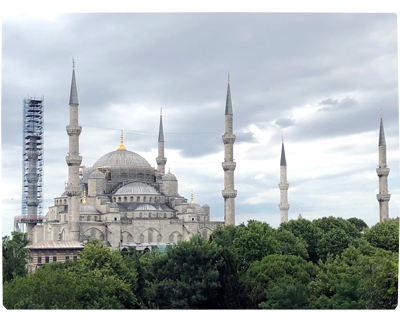 – We visited the Museum of Turkish and Islamic Art and bought 5 Museum Passes (5 day pass) for TL 125 each – this was a tip I read from a few travel guides: to buy the pass a day before, in the evening, to skip the queues for the next morning. – Our kids were very tired, so we had to head back for an early night. – Up early for breakfast at Sultanahmet Square. – Morning walk to see Gülhane Park (next to Topkapi Palace), went to see Topkapi Palace. We already had the Museum Pass, so we skipped the enormous queues, it was so good. – Lunch at Seven Hills Restaurant (roof top) with amazing views of the city! 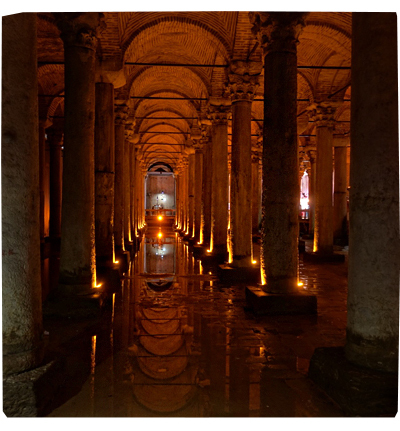 – Went to see the Basilica Cistern (ancient underground water storage). – Went to see the famous Sultan Ahmet Mosque (Blue Mosque). *We did this whole day by walking! – Walked to see the Istanbul Archeological Museum. – Walked around Karaköy to Galata Tower. – Had lunch at another rooftop cafe, Konak Restaurant in the Galata area. – Breakfast at Sultanahmet District. The kids were tired and not feeling great. – We checked out of Airbnb. Went back to the Hagia Sophia to take more photos. – We ate and walked around to do some souvenir shopping near Sultanahmet Tram Stop / Basilica Cistern, where there were lots of shops and cafes. – Then we left for the airport at 2pm for a 5pm – and we *just* made it to the plane because of the bad traffic! On hindsight, we could have seen a LOT more sights and did more stuff. I would have loved to have seen the Walls of Constantinople (saw it zoom by through a taxi window! ), Suleymaniye Mosque, Hagia Irene, Taksim Square, Spice Bazaar, Dolmabahce Palace, or maybe a Bosphorus River Cruise… but we couldn’t fit it around the kids and their energy levels. But that’s ok! It was still a fantastic trip, and we all rate it as one of our coolest trips ever!